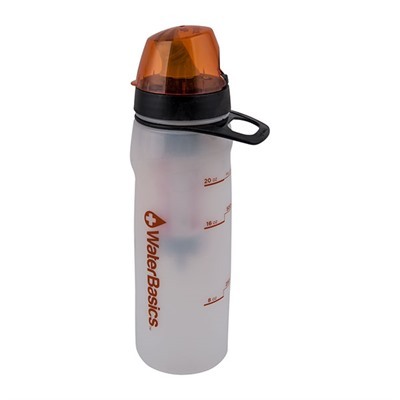 The WaterBasics GRN Line Filtered Water Bottle is the perfect way to enjoy great tasting, filtered water with just a squeeze and a sip. The simple to use design makes it easy to have fresh, clean, filtered water at home, at the office, in the gym, or for all kinds of outdoor activities. When you drink from a WaterBasics GRN Line Filtered Water Bottle, you are assured of a thoroughly tested and proven level of biological protection that includes protection from bacteria, protozoans and chemical and biological toxins. The high flow properties of the GRN Line filter make the WaterBasics GRN Line Filtered Water bottle as easy to drink from as sipping soda through a straw. With a price point c Mfg: Aquamira Technologies, Inc.